Indian Head Massage is a deeply relaxing, yet stimulating massage which is extremely beneficial for relief of tension from upper back, shoulders and neck. Swedish Massage encourages relaxation and stress reduction thus allowing the body to function more efficiently. Massage strengthens the immune system and is extremely beneficial for improving posture. Natural Face-Lift Massage look and feel younger with a gentle massage, delay the ageing process and bring relief from tension in muscles of the face, neck and scalp. The Metamorphic Technique is an effective tool for self realisation. A gentle massage of the feet, hands and head can assist you to go from who you are now to what you can be and already are in potential. Reiki is a non-invasive healing where the Universal life force is channelled through the therapist to the recipient hereby working towards the path of realisation. Reflexology relaxes the mind, body and spirit thus reducing stress, increases energy and vitality. Karuna is a Sanskrit word used in Hinduism and Buddhism. Karuna increases motivation for self improvement and assists on manifesting goals. Hypnosis is as old as the human race which has existed since the beginning of recorded history. By placing the client into a deep state of relaxation and working with the subconscious mind to release patterns or habits which are no longer of service. Shamanism is the practise of reconnecting, learning, healing and co-operating with the spirits who are also inhabitants of the universe thus restoring the unity of the cosmic web by the means of walking between the world of the physical and subtle reality. Hopi Ear Candles induces a pleasant feeling of warmth and balance of pressure in the ears, forehead and sinuses. It is soothing and helpful for earache and headache, ear noise and nervousness. Complementary Therapy Parties for Hen Shines, Groups or reconnecting with family or friends. The Therapy Party incorporates a fabulous experience of increasing your self awareness through creativity and a therapy of your choice. 'On-Site' chair Massage is a 15 minute massage, fully clothed, without oils, practised on a specially designed chair in your workplace. The benefits of 'On-Site' chair massage to your employee's are: relaxes tense muscles, reduces tension, relieves aches and pains. The massage also increases alertness, concentration and alleviates symptoms of stress - eye strain and headaches. Raising 'Health Awareness' and the 'Feel Good' factor further assists to achieve a happier work environment with greater productivity. 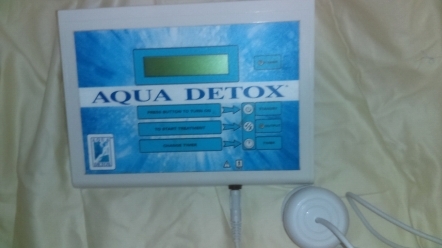 Detox your body with Aqua Detox by simply placing your feet in water and start the detox. The Aqua Detox apparatus produce a frequency (from the array) which resonates gently through your body and stimulates all the cells within it. This has the effect of rebalancing the cellular energy, thus enabling the cells to perform efficiently and to release any toxins which may have built up.